BOOK NOW FOR 2019! 2 BR/2 BATH DELUXE UNIT! Tower I-overlooks lagoon pool! Condo, 2 Bedroom/2 Bath Deluxe (Sleeps 6) OVERLOOKS GULF AND HUGE LAGOON POOL! WE RESPOND IMMEDIATELY TO ALL REQUESTS! In May of 2008 we acquired this beautiful condo on the sixth floor in TOWER ONE - the most desirable location at Edgewater Beach Resort. Our spacious unit is tastefully decorated and overlooks the 11,500 tropical lagoon pool with the sugary white sands and the gulf of Mexico as the backdrop. Not only can you enjoy this panoramic vista from the large balcony, but it can also be viewed through the ceiling to floor window wall in the comfortable living room and dining room. 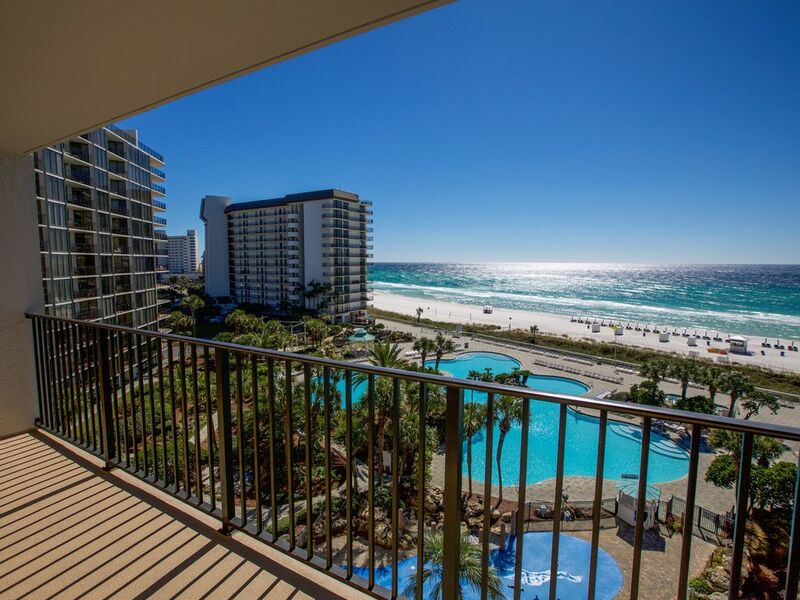 Edgewater boasts more amenities than any other Panama City Beach resort. For the kids you may purchase daily or weekly Adventure Zone passes. Purchase of a pass includes access to all Adventure Zone amenities and activities and additional discounts and specials at select local businesses. Discover Scuba will let you try scuba to experience scuba equipment in a controlled environment, our Lagoon Pool, to see what it takes to explore the underwater world! This exciting course is taught under the direction of certified PADI instructors. Space is limited so sign up early at Activity Island. Let Mr. Surf’s trained professionals teach you to surf, skim &/or paddle board to the tunes of an ‘Endless Summer’ for an experience that will last a life time! Space is limited so sign up early at Activity Island. Recommended for Youth 6-15 years old and Adults 16 years old and up. Come to The Club at Edgewater for an energizing and fun filled atmosphere where our Director of Tennis will teach you be proper fundamentals to introduce you the wonderful sport of tennis! USTA modified equipment will be provided for this hour long session. Space is limited so sign up early at Activity Island. Located next to the Adventure Zone – Splash Pad entrance on the North/West side of the Lagoon Pool Deck. The resort has a 21 ft. tall obstacle course allows you to test your skills over twelve feet above the ground! You are secured by a full-body harness and a safety lanyard that attaches to the tracking system above. Please remember all Adventures must have close toed shoes, a shirt, and be at least 48 inches tall. Young Adventures 42 to 48 inches tall may participate if accompanied by an adult. The Splash Pad includes twelve fountains and interactive water features. Parents can either join in the fun or easily keep an eye on their kids from the surrounding deck. This attraction is open to children 47 inches tall and under who are accompanied by an adult. Come lounge poolside and experience the movies like never before on our 220 inch screen! Located on the Lagoon Pool Deck. Included in your Adventure Zone Pass is complimentary use of our Par 3 Executive 9 Hole Golf Course, 10 Lighted Tennis Courts, Fitness Center, Basket Ball Court, and Shuffle Board Courts at The Club at Edgewater. Forgot your racquet and clubs? No problem, rentals are available. Open daily 7:00 a.m. – 7:00 p.m. To reserve a tennis court or tee time please call The Club at Edgewater. On the beach you will find jet ski rentals, parasailing, or you can brave the big banana. Golfers and tennis players need only to walk across the street to EBR's own golf course and tennis courts. Within a couple of miles of the resort you will find Shipwreck Island (a huge waterpark), dinner cruises, Shell Island, night clubs, Gulf World, a state park, sport fishing, and fabulous Pier Park. Everything you need to help you relax and unwind can be found at Edgewater Beach Resort either on the property or within a short walking distance. We love our condo and Edgewater, and we are sure that you will too! It is the best of both - huge pool and ocean! What makes the condo unique is that is right in the center tower of the resort - the tower that overlooks the huge lagoon pool! I like it also because it's not too close to the elevator. Once you stop at the grocery store and buy your food for your stay, you don't have to leave the resort again for your entire stay!. There is a great restaurant right on by tower 1 and also a shop that sells pretty much anything you might have forgotten. It also has an ice cream and coffee bar. There is a pizza palace by the pool also and a game room for the kids. If you do decide to leave, EBR is close to most all PCB's top attraction like Pier Park. Bathroom 1 adjoins the master bedroom. It is made up of three rooms: double vanity area, large walk-in closet, and toilet/bathtub/shower area. Bathroom 2 adjoins the second bedroom and has a single vanity and a toilet and a combo shower/tub. It also has a door to hallway. You can see the golf course across the street from the back of the condo. On site parking. You do NOT have to walk across the street to a parking lot or deck. Bath towels only! No beach towels are provided. A fitness room is located across the street at the EBR golf villas. A small fee is required to use the fitness room. Regular coffee maker and a Keurig are provided (bring your coffee pods). Coffee filters are provided. A small selection of paperback books (beach reads) are available for your enjoyment. A resort game room is located adjacent to the lagoon pool. Tennis courts across the street at EBR golf villas. A nine hole golf course located across the street. (3) One large lagoon pool which sit directly between Tower One and the Gulf of Mexico and two smaller pools in front of Towers two and three. Two of the four resort hot tubs are adjacent to the lagoon pool. Stayed a month. Comfortable, spacious, and relaxing. Much needed after our home was uninhabitable after Hurricane Michael. Thank you Tammy! Very nice, well appointed, nicely furnished unit with a spacious and open layout. We were very pleased and intend to return. Thank you for your review on our unit, and we are glad you enjoyed your stay. We work really hard to have a comfortable and updated unit for guests to enjoy. We are so sorry that you did not like the appliances. Some were just purchased a year ago and the oldest appliance is five years old. We replace the small appliances; like the coffee maker, Keruig, and toaster; every year. We like the white appliances because they look better for a longer time than the stainless steel (which scratches and dents easily). We hope that you will come back and stay with us again soon as we would love to have you again. Loved our stay in this condo! Looking over the pool and beach from our balcony was amazing! Will be back! Beautiful location overlooking gorgeous lagoon pool! Our family had a wonderful time at this location. Condo was very clean and well decorated! My son's fiance stated "I want to have my wedding here!" Thank you Deborah for your review, and we are so happy that you enjoyed your stay at our condo. It is a beautiful resort and would be a lovely location for a wedding. Just let us know when we can book you, and thanks again for spending your vacation at EBR unit 611. Negotiable on payment schedule on reservations 6 or more months from booking date. Please read the rental agreement carefully, most importantly the sections concerning refunds. You are highly encouraged to purchase trip insurance, especially if you will be staying during hurricane season. We can only refund for the days there is a mandatory evacuation. Our insurance will only reimburse us for those days.